We are all Earth Mamas who have had Angel Babies! I love the name of this company, and I love what they represent. Product safety is the most important thing. Every Earth Mama product is made with only pure, natural worry-free ingredients. We continually refine products as organic ingredients or more efficient herbs are available. Of course there are no toxins ever. We provide research, tools and products that can empower women with knowledge about the earth’s natural resources so they can safely nurture themselves and their angel babies. It is also our goal, in times of grief, to help provide real physical support, resource information, and emotional and spiritual comfort to women who have experienced the loss of a baby. This company is pretty darn perfect! 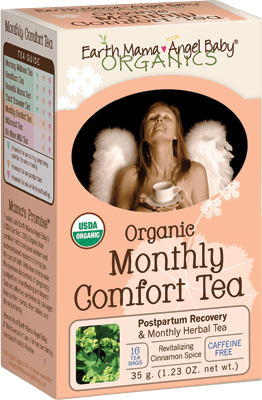 Formerly known as Postpartum Tea, Organic Monthly Comfort Tea is a calming, soothing, USDA Certified 100% Organic, Certified Kosher and Non-GMO Project Verified blend created to jumpstart recovery immediately after childbirth, and for “that time of the month” when hormones are raging and your uterus and you could use some extra care! Formulated especially for women, with a Cinnamon delicious combination of nutrient rich, 100% organic herbs, Organic Monthly Comfort Tea blends astringent Lady’s Mantle with balancing Lemon Balm, mineral rich Nettles and Alfalfa, and rejuvenating Ginger to help ease cramping. Organic Monthly Comfort Tea is a natural for our menstruating mates and perimenopausal pals, and perfect for recuperating postpartum mamas. Sip a cup within an hour after childbirth and then 3-4 times a day for a week. For monthly discomfort, sip as often as needed! I love this tea! As I am aging, my cycles become less consistent, and this tea brings comfort. So much excitement, so much anxiety, so little rest! Pregnant women know resting can be tricky when your mind is running amok with worries about your pending precious angel. USDA Certified 100% Organic, Certified Kosher and Non-GMO Project Verified Peaceful Mama Tea combines calming herbs in a delicious blend to help ease a mama’s busy head and agitated body. Works for anxious papas too! Formulated with tension easing Lemon Balm, calcium rich Oat Straw, calming Chamomile, and a whiff of Red Raspberry Leaf and Orange Peel to ensure you a comforting cuppa! Enjoy a relaxing cup of Peaceful Mama Tea before bedtime. Then settle down, be at peace and marvel that you are growing your beautiful angel baby, naturally. A peaceful mama makes for a peaceful family. This is good tea for Papa too! Sometimes you want a bath to clean, sometimes you want a bath to calm, sometimes you want both! Naturally calming, organic Vanilla and Lavender pure essential oil make Calming Lavender Shampoo & Body Wash perfect for a calming bubbly bath, hand washing and head-to-toe clean. Earth Mama’s baby shampoos are body wash too, and contain no artificial fragrances, foaming agents, sulfates, preservatives, parabens, or dyes. No antibacterial pesticides either. Just safe, detergent-free all-natural and organic castile shampoo-soap for foamy fun baby bath time, hand washing and head-to-toe family clean. Rated 0 for toxins on Skin Deep. Zero toxins means it’s safe for pregnancy, baby and EVERY body! I love the combination of lavender and vanilla! Yum! My two favorite scents! As you can tell, I am enamored with Earth Mama Baby Angel products. I wish I would have discovered this line when I was going through the pregnancy and birthing years; however, most of these products are great for families of any age. Even though my children are nine- and twelve-years-old, I still insist on using only organic, truly non-toxic products in our home…and who doesn’t love a yummy tea?